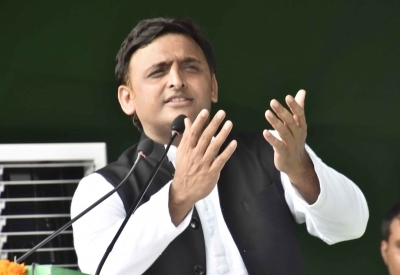 New Delhi Sep 15 (IANS) Former Uttar Pradesh Chief Minister Akhilesh Yadav on Saturday threw hints that the SP-BSP alliance in Uttar Pradesh could include the Congress in the 2019 Lok Sabha elections. "Today there is electric cycle... there are cycles having many pedals you can see on the streets of Manhattan. In today s time many people can ride the same cycle at the same time and it goes where it is supposed to go. The cycle will be run jointly" " he said on being asked about the position of the Congress in his party s proposed alliance with the BSP in Uttar Pradesh for the next parliamentary elections. Cycle is the election symbol of the SP. The Samajwadi Party had a tie up with the Congress in the last Assembly elections in 2017 and the alliance had failed miserably and ever since there has been speculation whether the Congress would be part of the anti-BJP alliance. Speaking at the "India Today Mind Rocks 2018" conclave Yadav said his friendship with Congress President Rahul Gandhi was a "nice one" and is still the same. He also said the Bharatiya Janata Party (BJP) was afraid of the friendship between him and Rahul Gandhi. Asked about reports that the Congress and the Bahujan Samaj Party (BSP) were coming together in Madhya Pradesh for the Assembly elections and whether the SP would be part of it he said he was not aware as to who was aligning with whom in Madhya Pradesh. But if an alliance was to be made between the two parties "then we (SP) will like to be part of it" he added. To a question on how the SP can go with the BSP given their bitter rivalry in the past the SP chief said if the BJP can make an alliance with 40 parties "what s wrong if SP goes along with BSP". On being asked about the reported quarrel in the Yadav family he replied: "There is fight in every family. Which family does not have a fight?" Then in an apparent reference to Prime Minister Narendra Modi Yadav said that "a person who does not have a family how can there be a fight". Attacking the BJP Yadav said the BJP fought election not in the name of development but on the basis of caste and religion politics. "BJP won election not on development but through caste and religious politics " he added. He claimed that people of the country were desperately looking to change the prime minister. Yadav said Modi should not mislead people in the name of corruption as demonetisation has not checked the evil. He questioned the BJP s claim on the law and order situation in Uttar Pradesh saying maximum rapes and murders occurred in the state under its rule and several "encounters" during Yogi Adityanath s rule were under the scanner. He also accused the BJP of taking credit for expressway and metro that was built or planned during his regime. "Prime Minister Modi inaugurated the expressway built by my government. SP never given credit for its work " Yadav said. He also said his government had failed in marketing its development work. "We could not match BJP s marketing acumen " he added.